The gene mutation responsible for albinism in donkeys on the Italian island of Asinara has been identified by researchers. A unique albino donkey sub-population lives on Asinara, which was closed to the public in 1885 to become an Italian quarantine site and later a prison colony. The 52 square kilometre island, northwest of Sardinia, is now a national park. 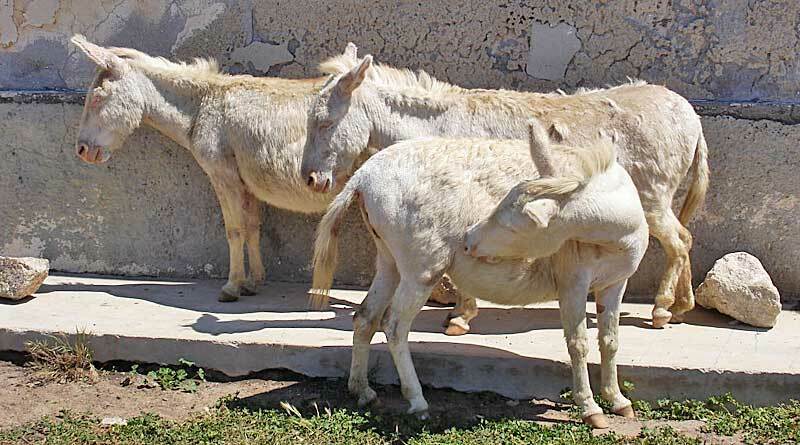 The 100 to 120 albino animals live with coloured − usually grey − donkeys on the island. They interbreed, with no estimate available on the size of the hybrid population. Luca Fontanesi and his University of Bologna colleagues, in a short communication in the journal Animal Genetics, said the origin of the island’s white donkeys was uncertain and based only on legends. It was possible, they said, that they dated back to before the closure of the island to the public in the late 1800s. There has been no direct human intervention in the management of the donkeys for more than a century. The researchers delved into the genetic basis of the donkeys’ albinism, with the animals displaying a completely white coat colour, a lack of pigmentation in the skin, hair, eyelashes and eyebrows, and eyes that are light blue. These donkeys have poor sight and during sunny days will shelter inside the unused buildings of the prisoner colony. The study team suspected a mutation in the TYR gene was responsible for the albinism and they were proven correct after analysing data from genetic sequencing of seven Asinara albino donkeys and six coloured donkeys. They found what is known as a missense mutation, in which a change codes for a different amino acid. In this case it affected copper binding, ultimately resulting in a lack of pigmentation. The findings were confirmed in genetic testing of further donkeys. In all, 82 were tested. The study team said the isolation of the population and high inbreeding might be behind the increased frequency of the TYR mutation. They said the identification of the cause of albinism in the donkeys added a new natural animal model for this particular form of the condition in humans. The short communication can be read here.